There are many articles about the newest version of WordPress: 4.7. They range from posts oriented to casual WordPress users to those intended for advanced developers. I’m using Colin Newcomer’s post on the Elegant Themes blog as a jumping off point, though I shift things quite a lot. I’ll give a brief explanation about the changes for my clients and provide links to additional information that could be valuable to someone more interested in the technical details. Here is the official WordPress promo video about 4.7, “Vaughan”. The new WordPress default theme, Twenty-Seventeen, is the best default theme yet. It comes with some great visual features that a complete beginner will enjoy. This one called for a picture: The arrows on the screenshot point at controls that allow you to edit particular sections of a page while you view the rendered version. The Twenty-Seventeen theme is built with starter content. This gives beginning developers and adventurous users a grid from which to begin. 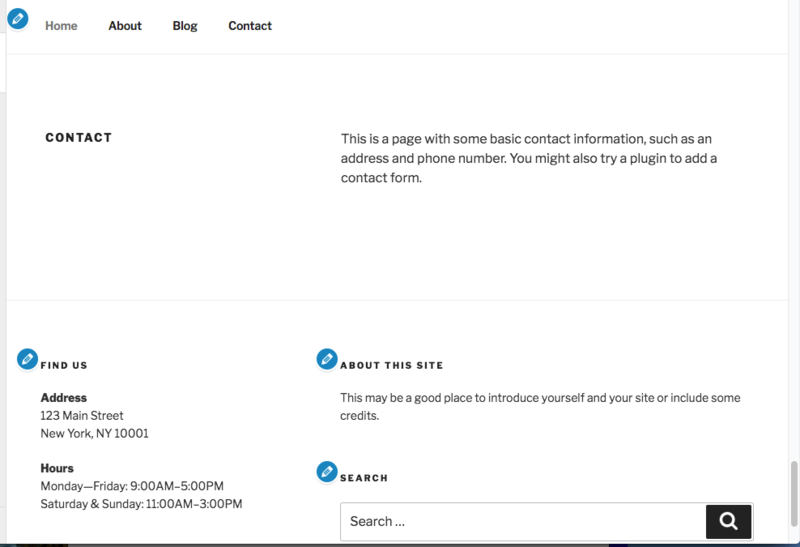 For example, it will guide users to set up a contact page, complete with menu, as in the screenshot below. This new media library feature supports showing thumbnails of PDFs while browsing media. You will need an image editor plugin that supports PDF to make it function. See the detailed notes on the WordPress website. If you have users who speak many languages, this is a great development. But they will only be able to select languages that have been installed by the administrator. Here are the WordPress site notes on locale switching. This development will ease the path for those who struggle with CSS. But it still won’t do the job for you. The best part is that you won’t have to create a child theme or use a plugin to retain your custom CSS after a WordPress update. Check out the full details in the WordPress Codex..
WordPress developers have long been able to make custom template types, but only for page types. Version 4.7 opens up the custom types to posts as well, improving the flexibility of the system hierarchy. For more in-depth information see Pascal Birchler’s post on wordpress.org. The upcoming release will make it possible for developers to register new bulk actions for any admin list table dropdown, including the Attachments list table. See Eric Andrew Lewis’ article on Make WordPress Core and a quick introduction by Sarah Gooding on WP Tavern. REST API endpoints are all the rage among developers, especially among those who want to use WordPress as a backend content management system but use other front-end display mechanisms, such as themes, single page web applications, and mobile apps. It’s a big subject. You can get a head start with the official Rest API Handbook on WordPress.org. All in all, WordPress 4.7 is a big release!